Dralasites are short, rubbery aliens that have no bones or hard body parts. Their skin is a flexible membrane that is very tough and scratchy. It generally is dull gray and lined with dark veins that meet at the Dralasite's two eyespots. The internal structure of a Dralasite is very different from the other races. The Dralasite's central nerve bundle (brain), numerous small hearts and other internal organs float in a pudding-like mixture of protein and organic fluids. Dralasites breathe by absorbing oxygen directly through their skin, so they have no lungs. They are omnivores, but eat by surrounding their food and absorbing it, so they also have no digestive tract or intestines. All Dralasites go through male, female and neutral stages during their lives (these phases can be controlled with medicines). Males release spores into the air, which drift until they become attached to a female. A young Dralasite then "sprouts" from its mother, eventually maturing and dropping off. The most important sense for a Dralasite is smell. They breathe directly through their skin, and the entire membrane is sensitive to odors. Their sense of smell is so keen they can identify persons by smell alone and can recognize familiar smells on objects or persons. The membrane also is sensitive to touch and to vibrations, allowing Dralasites to hear and feel. Dralasites see only in black and white. They see shapes and light and darkness very clearly, and can see a difference between distinct colors (blue and green, for example) because one is darker than the other, but they do not see actual colors. Dralasites have a voice box, but it works like a bellows because they have no lungs. A Dralasite's voice can vary from a soft whisper to a thundering roar and from a bass rumble to a piercing screech. Among themselves, they also use shapes, odors and touch to communicate. Dralasites are philosophical and thoughtful. Their communities are small, and many Dralasites prefer to live alone. Dralasites do not care about wealth, power or status symbols. They judge themselves by the quality of their ideas and their ability to discuss important ideas wisely. Dralasites often hold large public meetings to discuss new ideas. Discussions and debates are among their favorite ways to relax. Steam baths are another favorite Dralasite recreation. They mix perfumes and intoxicants with the steam. These effect Dralasites the same way alcohol does a Human. Dralasites are widely known for their strange sense of humor. They love old jokes and puns that make Humans groan. Many Human comedians who could not find work in Human cities have become rich performing on Dralasite worlds. Dralasites do not normally wear clothing, because it makes breathing difficult and interferes with their sense of smell. They usually carry their equipment on web belts. When they must wear clothing to protect themselves, they use special materials that let air reach their skin. A Dralasite's skin is stretchable and supported by a complex muscle structure. This allows them to change the shape of their bodies, within limits. 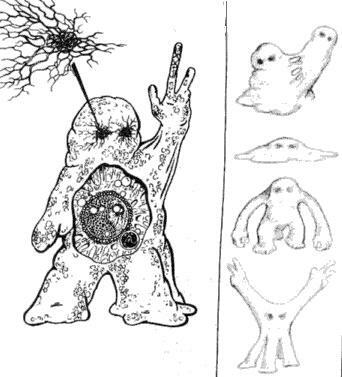 They can "grow" arms and legs to use for walking and handling tools and weapons, and reabsorb limbs when they are not needed. A Dralasite can have a number of limbs equal to its number of Dexterity dice (drop the pips). The player must decide whether a limb is an arm or a leg when it is grown. For example, a Dralasite with a Dexterity score of 3D can control up to three limbs. It could have Two legs and one arm, one legs and two arm, no legs and three arms, or any other combination adding up to three or less. Growing or absorbing a limb takes five minutes. Only one limb ran be grown at a time. A limb can be up to 1 meter long, and no less than 10 cm thick. "Fingers" for handling items can be up to 10 cm long and no less than 1 cm thick. Even though a Dralasite can have many arms, it can not fire more than two weapons at once. When a Dralasite player creates limbs, he must specify one as the dominant limb, the same way a Human must choose to be either right or left handed. Also, despite a Dralasite's stretching and shrinking, the pattern of veins and ridges on its skin does not change, so they have a permanent "fingerprint" for identification. All Dralasite characters have a chance to realize when someone is lying to them (+1D to Perception to detect lies). The Dralasite must be communicating face to face with the character, and the Dralasite player must tell the GM he is trying to detect a lie.